A few weeks ago, one of our suppliers came in with some fleece samples. I have to admit, fleece does not excite me but when I saw this fleece-backed knit, I fell. in. love. I never thought I would fall in love with fleece, of all things, but this was such nice quality and I loved the knit/fleece combo. I was so excited about starting this project that I went home that night and I searched through my pattern stash and many pattern websites until I found the perfect pattern for this fleece. 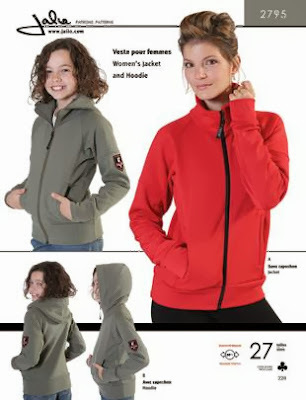 I came across Jalie Pattern #2795, a zip-front jacket and hoodie. I loved the ready-to-wear look of the pattern. I find that jackets like this tend to be really oversized by other pattern companies, and I did not want that. Since this was my first Jalie Pattern, I glanced through Pattern Review to see if anyone else used it. It got good reviews and everyone seemed to looked great in their jacket! I didn't have any local sources for purchasing the pattern, so I ordered it from an eBay store. Since Jalie Patterns is new to me, I thought it probably is for others as well! I'm going to do a mini Sew-Along featuring some information about Jalie Patterns and my process in working with this pattern and the fabric itself. When the fabric arrived, I cut about 2 1/2 yards off the roll, just like the pattern called for. 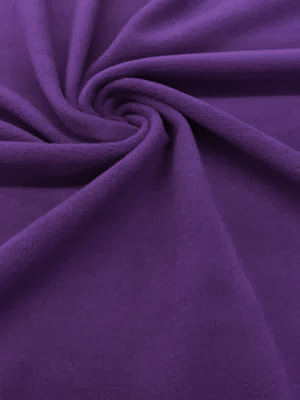 I selected UUC0419 - Purple Fleece Knit. This type of fleece knit comes in other colors, you can check them out here. I cut out size 12, so I cut on the Y line. The directions are also printed on the same page as the pattern paper, so I cut those out and hung them on my pattern clips. In a Jalie Pattern, the written directions are separate from the visual directions. The written directions refer you to which picture to follow. Jalie Patterns also want you to use a 1/4" seam allowance, which is included in the pattern measurements. I bought this hanger at Ikea. It is perfect to hang pattern directions and pattern pieces! Now comes laying out the pattern on the fabric! I was surprised to see how they wanted you to lay out your pattern pieces. They actually had you laying them out right next to the pattern piece you would be sewing them to. I actually really liked that. You would do something like this when using fabric with a plaid, stripe, etc. But because this fleece is basically solid, there was not a need to do this. I did it anyway, it was nice to be able to visualize which pattern pieces go together. Stay tuned, I'm on to cutting out the pattern pieces, then on to sewing! Until next time...happy sewing! Ooooh! I've been wanting to make a sporty sort of jacket for hiking, etc. I am so curious how this works out! Wait till you see it finished! How do you deal with cutting the different sizes? I don't like to cut my size from the pattern as I like the option to use a different size at a different point. I do have chalk, and tracing paper that I've used with a wheel (where the chalk is transferred to the fabric). Just curious what different methods you have. Thanks! Hi Jenny, I'm not one to make a muslin first, but I'm sure that's what most people would say to get a good fit! I would say grading your pattern up or down is the best solution from one size to the next. Also, would you think this pattern would work well with the knit-backed fleece that was a Sue's Pick awhile back? It was a teal fabric. Yes! It is the same fabric as I used, just a different color! Thanks for this sew-along and introducing me to a pattern line that I'm not familiar with.